On the evening of 13 and the morning of 14 December, skywatchers across the northern hemisphere will be looking up as the Geminid meteor shower reaches its peak, in one of the best night sky events of the year. And unlike many astronomical phenomena, meteors are best seen without a telescope (and are perfectly safe to watch). 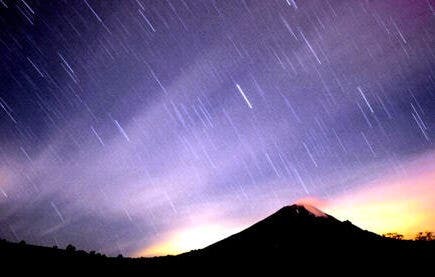 At its peak and in a clear, dark sky up to 100 'shooting stars' or meteors may be visible each hour. Meteors are the result of small particles entering the Earth's atmosphere at high speed, burning up and super-heating the air around them, which shines as a characteristic short-lived streak of light. In this case the debris is associated with the asteroidal object 3200 Phaethon, which many astronomers believe to be an extinct comet. The meteors appear to originate from a 'radiant' in the constellation of Gemini, hence the name Geminid. By 02:00 GMT on 14 December the radiant will be almost overhead in the U.K., making it ideally placed for British observers. By that time the first quarter Moon will have set, so the prospects for a good view of the shower are excellent. Meteors in the Geminid shower are less well known, probably because the weather in December is less reliable. But those who brave the cold can be rewarded with a fine view. In comparison with other showers, Geminid meteors travel fairly slowly, at around 35 km (22 miles) per second, are bright and have a yellowish hue, making them distinct and easy to spot. This year the peak of the Geminid meteor shower occurs at around 11:00 GMT on 14 December, but the highest level activity is spread over a period lasting a day or more. This means that if conditions are clear it is worthwhile observing at any time between Sunday night and Wednesday morning. As with most astronomical events, the best place to see meteors is at dark sites away from the light pollution of towns and cities. In good weather, rural sites such as Galloway Forest Dark Sky Park in Scotland (where a planned meteor watch will take place on 13-14 December) are potentially excellent locations to see the Geminid shower. The Geminids will also feature in a Twitter event, Meteorwatch, supported by the Royal Astronomical Society (RAS), where observers under clear skies can post their text, images and videos to share them with those in less favorable locations. Anyone with Internet access can join in by following @virtualastro and the #meteorwatch hashtag on Twitter. The last total lunar eclipse occurred on Feb. 20, 2008. While there are two total lunar eclipses in 2011, North American skywatchers will have to wait until April 2014 for one as potentially spectacular as the eclipse occurring this month. For the Western Hemisphere, the eclipse will begin on Dec. 21 at 12:29 a.m. EST (9:29 p.m. PST on Dec. 20) as the moon begins to enter Earth's outer, or penumbral, shadow. This total lunar eclipse lasts only 72 minutes from start to finish. Skywatchers will not notice any changes in the moon's appearance until about 45 minutes into the event, when a slight "smudge," or shading, begins to become evident on the upper left portion of the moon's disk. The entire total lunar eclipse will be visible from all of North and South America, the northern and western parts of Europe, and a small part of northeast Asia, including Korea and much of Japan. Totality will also be visible in its entirety from the North Island of New Zealand and Hawaii. In all, an estimated 1.5 billion people will have an opportunity to enjoy the best part of this lunar show. In other parts of the world, only the partial stages of the eclipse will be visible or the eclipse will occur when it's daytime and the moon is not above their local horizon. Portions of western Africa and central Europe can catch the opening stages of the eclipse before the moon sets below the horizon during the morning hours of Dec. 21, while the eastern third of Asia and central and eastern Australia can catch the closing stages just after moonrise on the evening of Dec. 21. December's total lunar eclipse and Geminid meteor shower promise to ring the year 2010 out with a dazzling show, weather permitting, this holiday season.